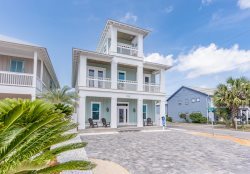 "Sea Salt" is a vacation dream home located on the West end of Panama City Beach. It features 6 bedrooms, 6 full and 2 half bathrooms, and will sleep 20 people. It features a private heated* pool, direct access to the beach, and is perfect for your beach getaway. *Pool heat available at an additional cost. The first floor features a second living area with a Queen-sized sleeper sofa and flat screen TV. Keep walking back and you will see a kitchenette with a second refrigerator, half bathroom, and a door leading to the outside deck area. On the second floor you will see a great open floor plan with a fully stocked kitchen, dining area with seating for 10 guests, and a cozy living room with a flat screen TV. Guests can enjoy all this space while looking out the full windows and glass doors at the beautiful Gulf of Mexico. On the second floor outside deck you will find the pool and a lounge seating area perfect for watching the waves and relaxing. Down the hall there will be a half bathroom and two bedrooms with en-suites. One bedroom features a Queen over King bunk bed, a flat screen TV, and the connected bathroom has a tub/shower combination. Across the hall is a King sized bedroom also with a flat screen TV and a walk-in shower. Head up to the third floor and you will find enough sleeping for 12 guests. On the north side of the home you will see a King-sized bedroom with a tub/shower combination in the connected bathroom and across from the hall is a Queen over King bunk bed room. Just outside this bedroom is a full bathroom and a Twin bunk bed nook, each with its own flat screen TV overhead. There are two master bedrooms, one Queen and one King, on this top floor that will make you not want to leave the home. Each room has its own personal bathroom, a flat screen TV, and best of all, direct access to a furnished glass balcony overlooking the ocean. The master suite, specifically, features a large bathroom with a double vanity and large walk-in shower. Call or instantly book Sea Salt today! ^ Age Requirements: All of Holiday Beach Rental’s vacation homes are family accommodations absent exceptions being explicitly granted by Management. No homes will be rented to students or singles under the age of 25, unless accompanied by a parent or guardian staying at the home for the length of the Rental Period. Violation of this policy will result in immediate eviction and forfeiture of all rental payments. In accordance with Florida State Chapter, reservations made under false pretense are null and void and check-in will not be allowed, or guests will be asked to vacate the accommodations. This policy includes reservations made by parents or guardians who do not check in, and/or leave overnight during the length of the stay. ^ No Pets or smoking allowed on the property. ^ Listing and Pricing: Information regarding individual listings is believed accurate but cannot be guaranteed. We have made every effort to ensure that all information on Management’s website(s) is current and accurate. Rates, furnishings, fees, and taxes are subject to change without notice. Before the trip emails and phone calls were very quick and very professional. Originally booked another property but the owners needed it during our week so this home was offered in exchange and it was a wonderful surprise. Everyone had a great time and wed love to come back here again.